The serratus anterior muscles and origin of the external oblique muscle. In this diagram, the scapula is drawn away from the side of the chest. 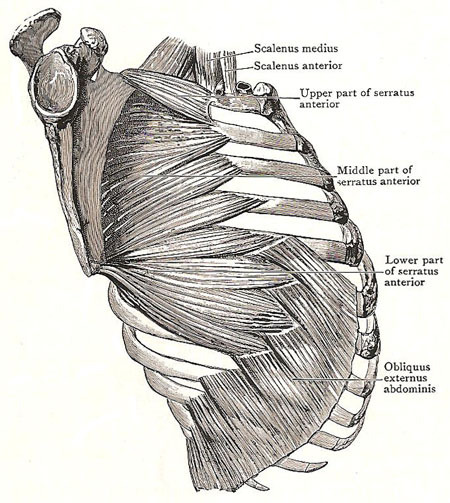 The serratus anterior is a large, powerful muscle that arises by fleshy digitations from the upper eight ribs about midway between their angles and cartilages. The slips are arranged on the chest wall so as to present a gentle curve convex forward. The lower three interdigitate with the external oblique muscle of the abdomen. The serratus anterior is inserted into the entire length of the medial margin of the scapula, and it falls naturally into three parts. The upper part is composed of the first digitation, which is the largest of the series. It arises from the first and second ribs and from a tendinous arch between them; and its fibers converge to be inserted into a triangular area on the costal surface of the upper angle of the scapula. The middle part consists of the two digitations from the second and third ribs, and its fibers spread out to be inserted into the anterior lip of the medial margin of the scapula. The lower part is composed of the remaining digitations of the muscle. They converge to form a thick mass which is inserted into a rough area on the costal surface of the inferior angle of the scapula. The deep surface of the serratus anterior is in contact with the chest wall. It is the most powerful protractor of the whole upper limb, and it assists in the rotation of the scapula that accompanies the raising of the arm above the head. Its usual action may be reversed so that, acting from the scapula, it raises the ribs in forced inspiration. It is supplied by the special nerve from the fifth, sixth, and seventh cervical nerves.